Just yesterday, we added a new functionality that we think most people will find valuable, something that your mail clients will never be able to achieve. 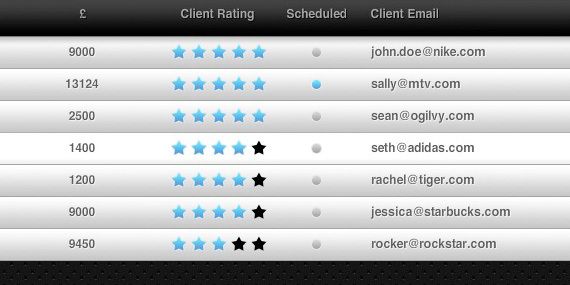 SUBERNOVA now lets you schedule emails to your client(s) on any date and time that you specify. Before we start, remember to set your timezone according to your country so that emails are sent exactly at the time that you specify. There are many reasons. Say, you just finished some revisions but it’s too late to send the changes to your client, you want to send out that email in the morning. But the problem is you might not be up until noon. Your mail app can’t send it out automatically for you, that’s where SUBERNOVA solves this problem. Again, there are many other reasons why you would use this feature, the possibilities are just endless. To start scheduling an email to your clients, go to the “Clients” section, click on your client’s email or the dot beside it. The dot lets you know at a glance which client have an email scheduled. Clients that have a scheduled email will have the dot blue in color, otherwise it’s grey. When an email is sent as per the schedule date/time, the dot will turn grey the next time visit the “Clients” section. You’ll also receive an email informing you that your scheduled email is sent. 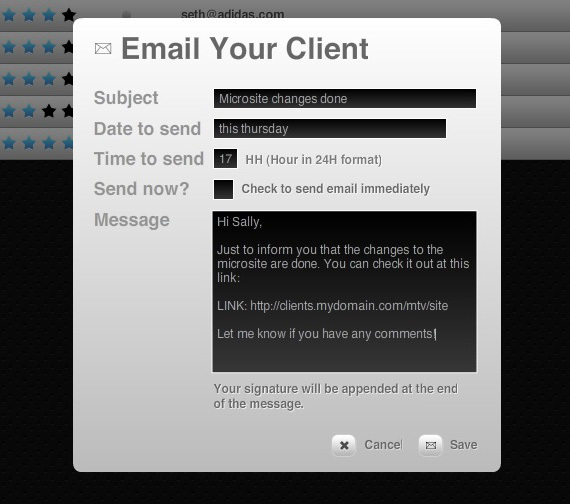 Once clicking on the email or the dot, a prompt will appear. You’ll be able to fill in the subject, the date (any format, even using natural human language like “today, next week” etc) and time (hour only) and your message. There is also an option to send the email immediately by checking the “Send now?” checkbox. Once you have everything filled in, you can either save it or send it immediately depending on whether the “Send Now?” checkbox is checked. At anytime you want to edit or stop a scheduled email, click on your client’s email or the dot again. Edit the email as you deem fit. To stop the scheduled email, hit the “Stop” button and your email will be cleared and will not be sent on the previously scheduled date. That’s all there is to schedule an email! We hope you find this feature valuable!